We understand your frustrations. You’re looking for the right food and restaurant photography for your newly launched website or restaurant menu. You’ve spent hours on Google looking for stunning, high-quality photos to use, but keep running into images that are low-resolution or protected by copyright. The good news is that the last few years have been somewhat of a ‘boom’ in terms of resources for royalty free food and restaurant imagery. Whether you need first-rate stock images for commercial use, for marketing, hero images for your Facebook page, or placeholders for your website, you can find it all if you know where to look. To save you time and hassle, we’ve put together this handy list of royalty free restaurant image resources. Take a look, and enjoy! Unsplash delivers ten new ‘use however you want’ images every ten days on their website and through an email subscription. What helps this resource stand out is the uniqueness of the photography. With a myriad of high quality images to choose from, you’re less likely to run into any cheesy, ‘Person Laughing While Holding A Salad Bowl’ kind of shots. Also, all images present on Unsplash fall under Creative Commons Zero (cc0), which gives users the freedom to modify, copy, use, and distribute the photos without attribution or permissions. You can navigate the site by opening the larger version of each image, but when browsing you may find it convenient to view images in a grid format. Foodies Feed is the premier resource for non-stockish, natural and realistic images of food. A Czech-based photographer started it as a personal project to share his passion for food with the world but later turned it into a 100% free food photos website that’s publicly accessible. Using the intuitive search function, you can find everything from toast to fish, from brunch to dinner, from coffee to soda, and even interior photography of eateries and restaurants. Most of the images do require a quick share on Facebook before it’s unlocked for download, but despite that, Foodies Feed is a great resource for any restaurant that requires appetizing images for their online ordering system frontend menu, Instagram feed, presentation, website, poster, etc. 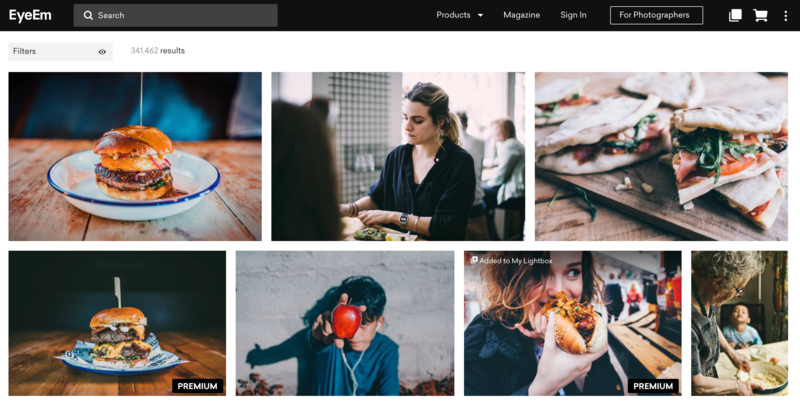 Burst is a royalty free photography site that’s on a mission to help users from all industries find the perfect free stock image for their next project. Burst photographers constantly add new categories and upload new photos to reflect ongoing trends, especially in retail and ecommerce. 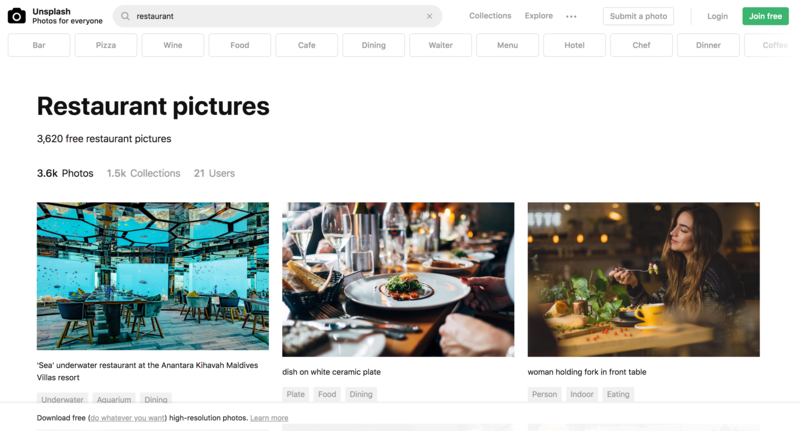 What many people like most about Burst is its themed collections, each of which houses high quality photos that are directly curated by its team. Users are welcome to download, crop, modify and use the images, and there’s no requirement to give attribution. 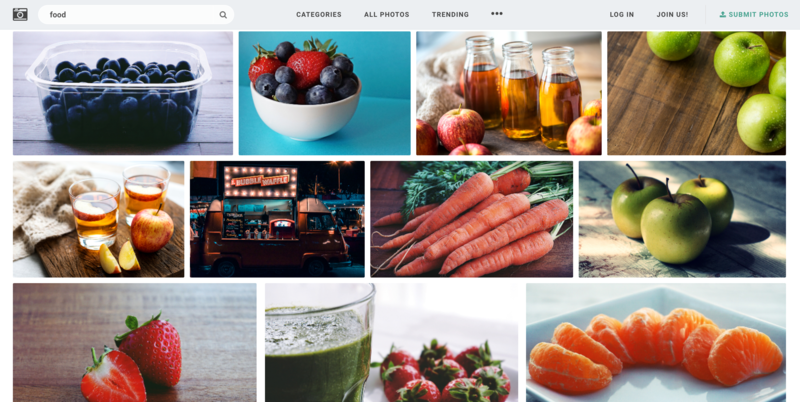 Overall, Burst is a great effort by Shopify to build a credible resource for royalty free images, and though it’s image library is not super deep, you can expect to find a good amount of options if you stick to the right keywords. If you’re a food entrepreneur with a strong eye for design then you’ll find that this website is one of the best royalty free image resources on our list. StockSnap’s image library contains an extensive bank of high-quality images which not only cover most aspects of design but offer depth and appeal that’ll make your website or Instagram feed stand out from the crowd. All images on StockSnap are released under the CC0 Creative Commons license, which allows users to modify, download, copy, and distribute images, even commercially, without needing permission. Aside from being able to download images, creating a StockSnap account enables you to ‘favorite’ photos. Doing so saves all your favorite pictures in one place without requiring you to download them in one go. iStock boasts an impressively large collection of royalty free images, illustrations, audio and video files that are curated with the highest standards. The site offers two types of subscription. One is ‘Essential’ wherein it offers everyday content in terms of photos, illustrations and vectors. The other one is called ‘Signature’ – it provides access to exclusive, high-value images as well as handpicked signature images. 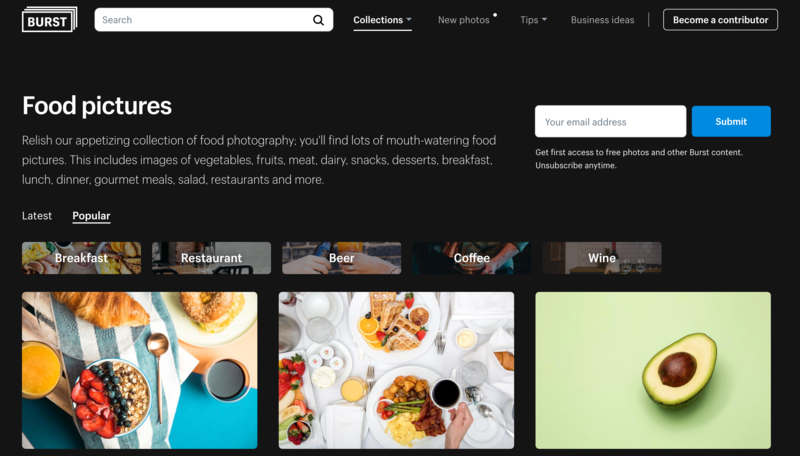 Photos on iStock are not only searchable by keywords, but also by contributor, file type, shape, complexity, details, collection, color, light box, and additional filters. Essential subscription on iStock starts at $40 and is good for downloading 10 images per month. The other option is to purchase an image using an iStock credit, with 1 credit being equivalent to 1 image and costing $12. EyeEm is one of the most successful premium royalty free photo websites – it has built a strong community around people selling and buying images. On the EyeEm marketplace, you’ll find food and restaurant photography that has been uploaded by others. If you come across an image that you’re interested in using, you can easily purchase its rights, which means you can use the image in your marketing campaigns without attribution. EyeEm offers three types of licenses: Social License, Web License and Full License. The Social License costs $20 per image and offers 1200 px @72dpi downloads. The Web License and Full License cost $50 and $250 per image respectively and allow full size @300dpi downloads. The pricing of these licenses is expectedly higher for the premium royalty free images on EyeEm. Shutterstock is without a doubt the most popular premium royalty free image website in the world. With well over a decade in the industry, it’s safe to say that they’re pioneers of the stock image business. 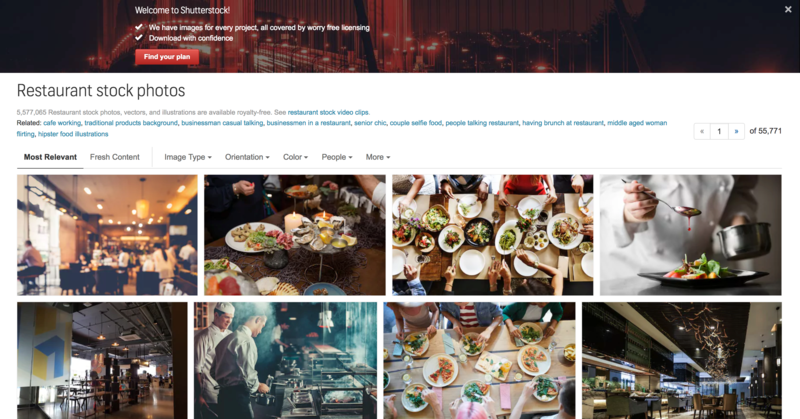 Restaurant owners can browse through more than 244 million royalty-free photos on Shutterstock. Every day the company adds 10,000 new high-quality images, which means you’ll have plenty of options if you use this website. There’s also an image-editing tool that allows users to resize and edit purchased images directly on Shutterstock – it’s ideal for entrepreneurs who aren’t proficient with image editing. As for pricing, Shutterstock offers different packages for individuals and teams. The individual package starts at $29 a month and allows for 10 image downloads. The team package begins at $379 a month and allows up to 2 users to share 750 images at maximum with their team. Teams also get access to tools that enable sharing and collaboration. 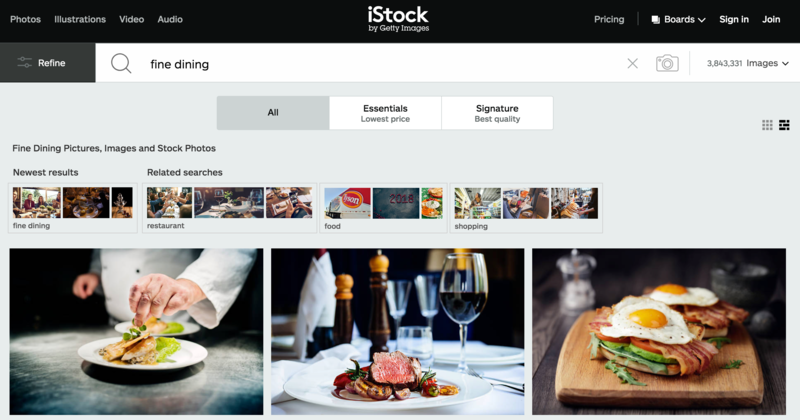 BigStockPhoto provides restaurant owners with a smooth and enjoyable experience when they’re navigating the royalty free image website. You get clearly laid out categories and drop down menus that allow you to find the food and restaurant photography you’re looking for. The site can be accessed in 20 different languages and houses a 15 million+ collection of royalty free illustrations and photographs. The basic subscription costs $69 a month and comes with a download limit of 5 images a day. The most expensive subscription costs $329 a month and will allow you to download a maximum of 50 images in a day. With resources like these offering high quality food and restaurant photography on a royalty free basis, a restaurant owner’s dilemma of sourcing images for their website and social media channels can be laid to rest. And remember, you aren’t limited to using just one of these sites, you should utilize all of them to take your branding and online footprint to the next level.